I am wondering what the boot sequence of the Raspberry Pi is in a typical setup (say NOOBS), from power application (or warm reset if that's different) up to, say, the apparition of the logo; or where that is described. What's the reset vector for the ARM CPU, and how/where is that defined? From what memory are the first ARM CPU instructions fetched? Where is that, and what technology is used to store this code? Is that ARM32 or Thumb (or perhaps Jazelle) code? Does that depend on the low order bit of the reset vector? Is source (or disassembly, or dump) of that early boot code available? If not, is anything technical preventing the use of the JTAG port to determine that? As for legal, I'm ready to assume the risk of trusting my understanding of the law applicable where I live (France), which is that I'm fully allowed to analyze my own computer, at least in the absence of an explicit contractual requirement not to do so. In what order are peripherals initialized, and by what piece of code? 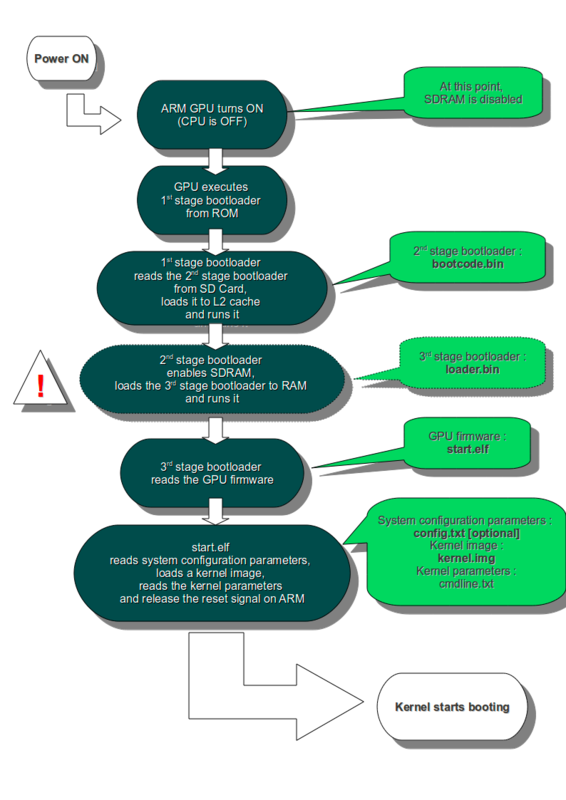 Beside the ARM CPU, is there some processor/automata running in the BCM2835, and in the affirmative how does its boot sequence relate to the ARM CPU? I'm ready to dive into the ARM CPU's Technical Reference Manual and BCM2835 ARM Peripherals, or any other doc. Update: After posting, I found this and this, stating the BCM2835's GPU is acting as a master to the ARM, and is heavily involved in the boot sequence.